Recently we had a rather interesting device in our hands: active USB extender (or USB RJ45 Extension adapter). At the same time, the seller promised that we will have an opportunity to extend the cable and connect USB devices to computer at distances up to 150ft (45 meters) with the help of this device. Now let’s take a closer look on what the device is and how it can be used. 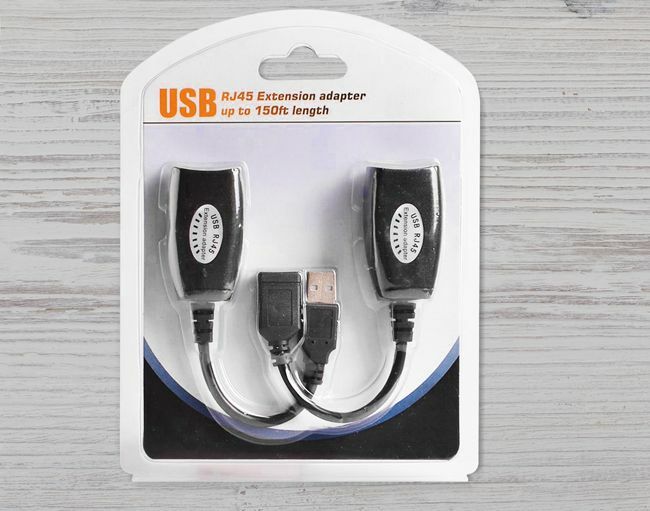 This USB extender allows you to connect USB devices to your computer at distances up to 150 feet (45 meters) using a Cat5/Cat5e/Cat6 UTP cable that does not come in bundle. This adapter allows you to extend your USB cameras, printers, web cameras, keyboards and mouse to the desired distance, while not moving the computer. Also we can read below that this device does not require any external power source. remote RJ45 to USB (‘Mom’) connector. At first, let’s try to connect a web-camera to the computer with the help of an Extension adapter. To do this, connect the camera to the 1-st extension adapter, connect both extension adapters to each other with a UTP cable, connect the 2-nd adapter to the computer. The computer now will detect the camera, and the camera can be used in just a moment (note that the driver for this webcam was already installed on the computer). When we were working with the camera, we did not notice any presence of an extension cable in the connection between the camera and computer. USB RJ45 Extension adapter was working fine with a webcam, no comments yet. Now let’s try to connect USB flash drive to the computer over USB Extenders: the computer detects a removable disk without any problems. We can navigate the disk, read files without any hangs and delays; it seems like everything is fine. 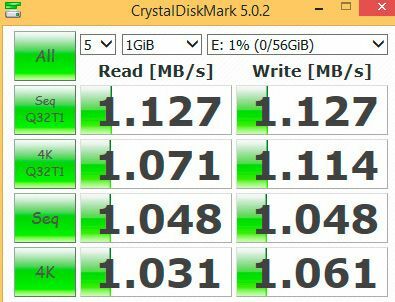 For completeness, we decided to test the USB flash drive with/without an extension cable using CrystalDiskMark. When using USB extender, the speed of reading/writing to the USB flash drive decreased to 1.2 MB/s (and that corresponds to the USB 1.0 specification (1.5 MB/s), but not USB 2.0/3.0). As you can see from the test results, the speed of reading/writing to the USB flash drive (using the USB extension cable) decreased in many times. But we want to note, that the connection remains stable and there is no breaks or interruptions in the work of the USB extender. Note. When using a 10 meter UTP cable, the read/write speed with the USB flash drive was close to the values that is defined in USB 2.0 standard. Thus, the transmitted signal is attenuated for a long cable length. The connection characteristics are also dependent on the UTP cable that connects your devices. To obtain a guaranteed high speed connection, use only high-quality cable of category not lower than 5е (and preferably 6 or 6е). 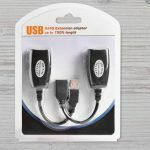 Thus, the use of an active USB extenders is suitable for the simplest cases (for example, when installing the USB 3G modem on an external antenna that amplifies the 3G signal, or connecting simple CCTV cameras). The use of such adapters to connect drives or wireless adapters over long distances is meaningless.